The Legend of Zelda: A Link to the Past is, in fact, twice the game it initially appears to be. Once you face off against Agahnim at the pinnacle of Hyrule Castle, the game shockingly reveals that the brisk world-spanning adventure you've undertaken so far — complete with prelude, dungeons, the Master Sword, and a final boss — is in fact only the tip of the proverbial iceberg. Agahnim banishes Link to the Dark World, a gloomy alternate reality laid atop the kingdom of Hyrule. This twist does much more than merely double the length of the adventure, and it functions as more than a mere reuse of assets. The Dark World was quite possibly the most intricately designed creation ever to have appeared in a video game to that point: A convoluted reworking of the kingdom players had already explored, and one that also, marvelously, managed to add unexpected new complexity to the seemingly conquered Light World as well. Of course, it is a matter of recycling of assets to a certain degree. Let's talk about that for a moment. The idea of the Dark World already had precedent in the Zelda series, after all. Once you completed the original The Legend of Zelda and the princess declared you the Hero of Hyrule, you could jump into a vastly more difficult Second Quest. There, the overworld looked identical to that of the initial adventure, but everything else changed: Dungeon locations, dungeon layouts, the placement of secrets, and the mix of enemies you encountered. 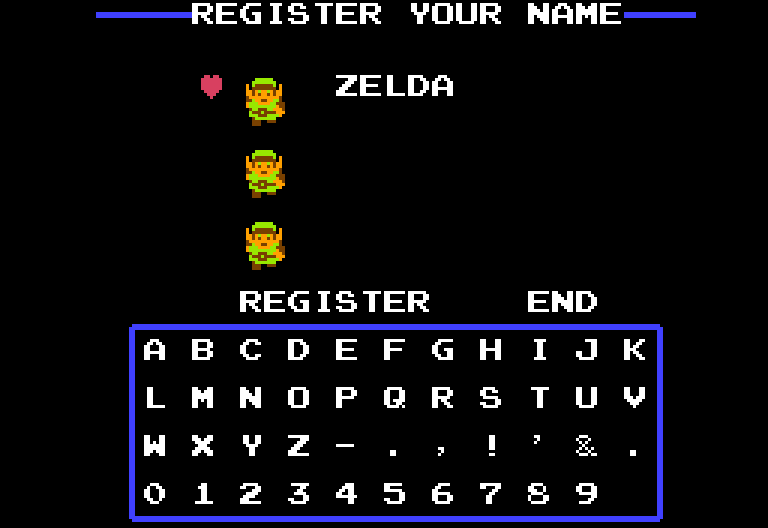 The original Zelda's Second Quest. When Zelda II arrived the following year, it disappointingly lacked its predecessor's remix mode. Disappointing, yes, but I'd say that the ALttP team more than made up for it a few years later with the Dark World, which effectively took the Second Quest concept and integrated it into the actual adventure. 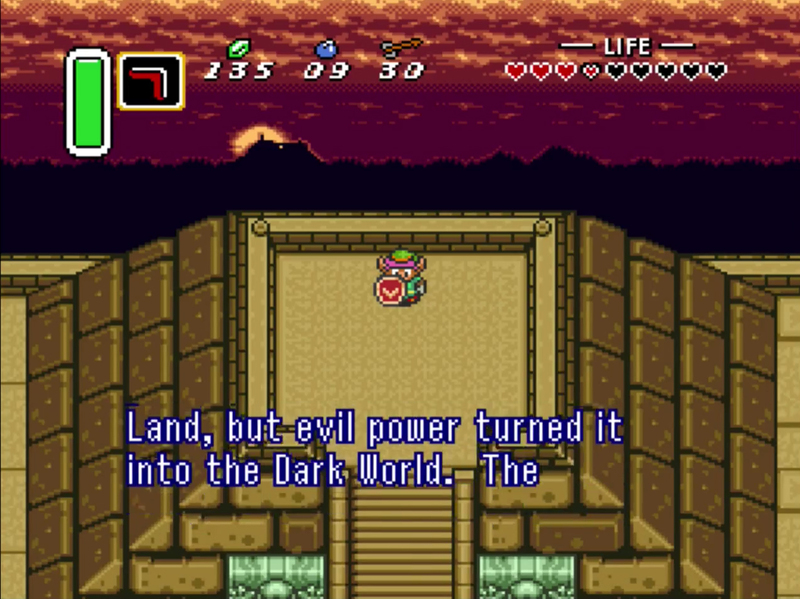 On its surface, both the Dark World and the Second Quest share much in common: Both reuse the first quest's (or first portion of the quest's) overworld. Both change up the location of all the game's dungeons (beyond the first dungeon, anyway; the Second Quest's first dungeon appears where you found Zelda's Level-1, and the Dark World's Helmasaur dungeon shows up in the same ruins where you sought Sahasrahla in the Light World). Both offer an elevated challenge level. And, finally, both the Second Quest and the Dark World turn your familiarity with Hyrule against you by forcing you to relearn the world and puzzle your way through to your new goals. The similarities end there. The Dark World isn't simply another remix of the realm you've already explored; it's a subtle yet comprehensive working of the game's geography, and the game's designer wove it back into and throughout the entirety of the Light World. You don't simply bid farewell to Hyrule once Agahnim banishes you, but rather continue to revisit it as you explore is shadowy counterpart. The Dark World puts your knowledge of Hyrule to the test, demanding you think back to peripheral details from the early going. Wasn't there that one ledge, just naggingly out of reach? That curious-looking island you could swim around once you acquired the Zora Flippers, but which seemed to have no proper access point? Some odd, impassable structure blocking a suspicious, isolated rock? All of these seemingly incidental elements become critical considerations once you reach the Dark World. Much like those tricky one-way passages in Zelda's Second Quest, the Dark World interacts with the Light World in a largely unidirectional fashion as well. Before you properly reach the Dark World, you acquire a magical mirror that allows you to warp from the Dark World to the Light World at any time, at any place. However, traveling in the opposite direction — from Light to Dark — requires the use of a handful of strategically placed and completely preset warp tiles scattered throughout Hyrule. A puzzle-like relationship between the two realms emerges. To explore the Dark World in its entirety, you need to sleuth out critical details in the Light World. At one point, you even have to throw a switch in one dimension in order to change the water level in the other. The game brilliantly introduces you to the Dark World by incorporating it into the prologue dungeons. In your trek to acquire the third and final medallion necessary for claiming the Master Sword, you briefly make an excursion into the other realm. Here, Link becomes a defenseless rabbit-man, scurrying across an eerie alternate-universe version of Death Mountain. While the jaunt lasts only a few moments, it impresses on you the importance of the Moon Pearl (which prevents Link's transformation) and the similar-but-not-identical nature of this mysterious land (such as the twisted, glowing echo of the Tower of Hera you can glimpse as you explore). Most importantly, though, your detour through the shadow realm teaches you about the somewhat logic-defying spatial relationship between the two dimensions. In order to reach the "real" Tower of Hera, you need to warp out of the Dark World from the blank patch of ground where Spectacle Rock stands in the Light World. Thanks to the game's three-quarters perspective, this causes you to shift from low ground to high ground when you warp: You're occupying the same visible tile of ground in each universe, but the Dark World tile depicts a flat terrace while in the Light World the tile serves as the upper side of a large boulder. This makes no sense in "real" geography — Link should materialize inside the boulder, bringing his adventure to a very quick and unpleasant end — but the designers took advantage of the abstractions inherent in the game's forced visual perspective and built a puzzle that demands you think in illogical terms. "The Dark World puts your knowledge of Hyrule to the test, demanding you think back to peripheral details from the early going." The Dark World constantly violates the rules of the world to create a sense of unease. When you first materialize in the ruined land after vanquishing Agahnim, you appear at the top of a pyramid with a view of the horizon behind you. Nowhere else in the game do you see a vista that violates the three-quarters view of the game's universal graphical perspective. Being able to see so far into the distance — you can spot Death Mountain and the alternate-universe Tower of Hera — helps communicate the fact that everything has suddenly, radically changed. The Dark World doesn't stop there in its attempts to put you on edge, though. Significantly, the game's parallel dimension comes into play shortly after players acquire the Master Sword in the Light World quest. Acquiring this legendary blade stands as a climactic moment in ALttP: Suddenly you have the power to slice effortlessly through every foe in Hyrule and fire a swirling beam of energy. Even the music changes to reflect your triumph, shifting from the previous melody to a bombastic rendition of the original game's overworld theme. And then, you reach the Dark World. The music grows eerie, and suddenly your almighty Master Sword — capable of tearing through every Light World enemy you encounter with ease — feels massively underpowered. 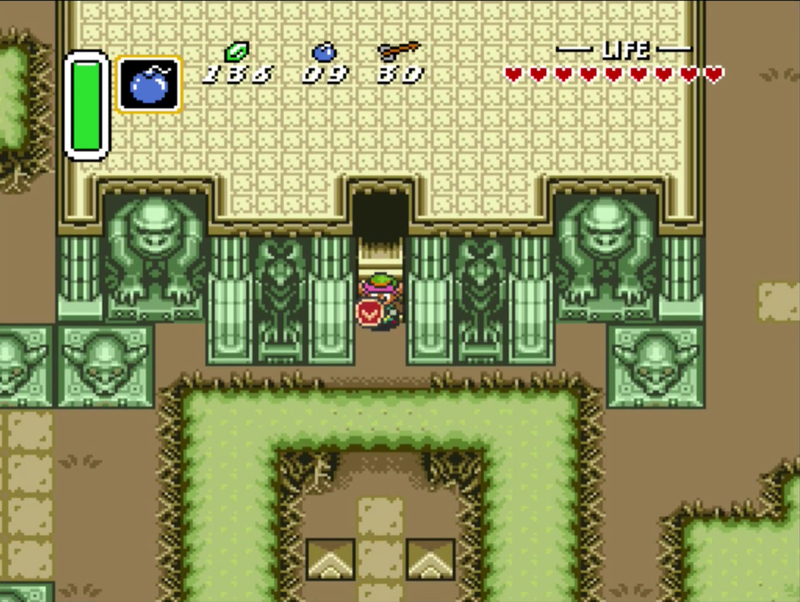 You descend from the pyramid at the center of the Dark World and immediately encounter a pair of Hinoxes: Towering cyclopses who toss devastating bombs one after the other — each bomb capable of blasting away a third of Link's health — and take five or six blows with the supposedly all-powerful Master Sword to defeat. In an instant, Link goes from being the triumphant hero to a fragile little insect. He may no longer be a pink bunny, thanks to the Moon Pearl, but he's lost and hopelessly overmatched all the same. Everything about the Dark World feels freakish — skewed. Not only do enemies possess far more power, they've also changed in nature. Human soldiers become bestial Moblins, while strange mushroom beasts fly around peppering the ground with bombs. Friendly non-player characters still show up in the Dark World, but they've been rendered helpless, pitiful effigies mourning their lost humanity. And the land itself has become divided: A field of stakes prevents you from accessing the entire west half of the kingdom until you complete the first Dark World dungeon, while the desert to the southwest has become entirely closed in. The transformation of Hyrule into the Dark World explains why the Light World prologue phase of the game spans the entirety of the kingdom. Even though it appears to cover the whole world and half the physical space you're ultimately forced to explore (between the two different dimensions), it comprises — at most! — a quarter of the overall adventure. The Dark World transforms Hyrule into a complex, maze-like space that feels almost like a sprawling dungeon in and of itself, and progress requires intimate familiarity with the lay of the land. You need that time in the Light World to help you learn the ins and outs of every part of the world. When you encounter some subtle difference or suspicious piece of scenery in the Dark World, your instincts will sense something is amiss. Nintendo could have simply repeated the Second Quest concept in ALttP, giving you one compact adventure followed by a more daunting remix. By combining the two quests into a single adventure, however, the game's creators didn't simply create a brilliant plot twist. They set a new standard for adventure games, offering unrivaled complexity and integrated puzzle design that turned the entire game into one extended labyrinth to be unspooled over the course of completing a dozen smaller dungeons. Even 25 years later, ALttP's interlocking multi-world design has rarely been matched by competitors... or by Nintendo themselves. Tagged with Analyses,	Classic Deep Dives,	Nintendo,	Retro,	SNES,	Super Nintendo.